The year is nearly over and Christmas Eve knocks on the door. I think I’ve waited long enough now to publish my list of the 25 albums that I enjoyed the most in 2018. The list is somewhat ranked to show the albums that I enjoyed the most near the top of the list, but it’s definitely not a definitive ranking of these 25 releases. I have included links to the music using the marvelous song.link website, so you’ll have a hub for every album that shows you links to your available music buying/streaming websites. Happy listening and happy holidays! This is not a long analytical piece but just an observation I felt I had to write down. Please keep this in mind when you want to comment on these thoughts. OS X updates may be much cheaper than Windows updates, but OS X versions have a much shorter lifespan than Windows versions. Add to that the costs for updates of other software you use on your Mac and suddenly you are paying way more than Windows users. Take Windows XP for example. This version of Windows was launched in 2001. More than eleven years later it’s still used by many people and a lot of new software you can still run on XP. As a contrast, take OS X 10.5 Leopard. Launched in 2007. A lot of new apps and software don’t run on 10.5. The minimum OS X these days is often 10.6 Snow Leopard, but sometimes apps already need at least 10.7 Lion to be able to install them. The Klout score is probably the most useless type of statistics I have ever seen. After thinking about it for a while I decided to opt-out and delete my account. The blog post I got this link from is linked below. It’s a recommended read and sums up exactly how I think about Klout. I would not be surprised if you deleted your account too after reading it. What I did not know for example is that Klout also builds a profile of people that don’t have an account with the service. By using the opt-out link above, you will prevent this from happening and have your data removed from their databases. One final tip: if you deleted your account, make sure you also revoke access from Twitter for Klout and remove the Klout app from Facebook in your privacy settings. Otherwise they still have access to your data. After checking a few posts on the announced Microsoft Surface tablet, my opinion is that they hit a sweet spot here. It’s going to sell very well. The Surface tablet will run Flash and it will run Windows RT apps that can also run on a desktop in the future when Windows 8 is released. The Surface Pro edition will run all your existing Windows software and can be used in your home environment and in a business setting. What I am seeing here is that the desktop world and tablet world are integrating slowly but surely. A few years from now, a lot of people won’t own a desktop or a laptop: they’ll own a tablet. It will be more than enough for everyday use for the majority of users. Hell, it will even be enough for most business users as well! This will be especially true if companies start making docks for tablets like Microsoft’s Surface that will transform it into a laptop-like device. My bet is that an awful lot of people will want to own a Surface tablet or an other Windows tablet from an other manufacturer. People are already used to Windows on their machines, at home as well as at work. The step to a Windows tablet will be much easier for them than stepping into Apple’s iOS world. That will not mean that Microsoft is going to reign the tablet space. Apple is the undisputed leader here and will keep that position for the at least the coming 3 to 5 years. Manufacturers of Android tablets should be more worried in my opinion. They could lose market share to Microsoft’s Surface easily, especially when you consider the hybrid desktop/tablet usage combination. After using the new iPad 3 for a day, I can tell you that I adore the new Retina screen. This improvement alone is well worth the upgrade. Text is so crisp and clear, even tiny letters on zoomed out webpages are still very easy to read. Because of this, reading for a longer period of time on the new iPad is far less tiring for the eyes. I have also noticed that I haven’t touched the ‘Reader’ button in the address bar of Safari once until now, while I did this all the time on my previous iPad for better readability. An other improvement that I like very much is the better upscaling of iPhone apps on the new iPad. I still use some iPhone apps on my iPad because there is no (good) iPad alternative. On the new iPad, these apps are a joy to use and very readable, especially when you open a webpage in an inline browser. Is Google Earning More Money from iOS than from Android? Here is a link to a very interesting opinion post on how much money Google makes from Android compared to iOS. Estimation of the earnings from Android have been based on Google’s proposed settlement of the Java patents lawsuit that was started by Oracle. I found the numbers surprising and they are probably not too far from the truth. Link : Digital Trends – Wait, Google earns four times more from iOS than Android? Oracle Database Under Threat in SAP Shops? A number of reporters visiting the Mastering SAP event in Sydney, Australia, wrote that there is a buzz among SAP customers who run their systems on Oracle databases to think about changing their database strategies in the future. When asked about which database they would likely be migrating to in the future in an informal survey, the majority answered surprisingly: Microsoft SQL Server. It’s attractive because it offers technology similar to SAP HANA (features known as columnar and in-memory storage) and its prices start at $11,000 per terabyte. It can run on comparatively lower-cost hardware such as new servers by Dell, too. Microsoft and SAP have been partners for years. When it came around to a discussion on HANA, there was much debate about whether customers will put their OLTP systems on this as yet to be available database. The question in my mind is whether there is any real advantage in moving to HANA which today, can provide huge speed improvements in analytic style scenarios. The answer is a heavily qualified ‘maybe.’ HANA’s columnar store thrives on complex aggregation queries but is slow when trying to replicate what amount to row store calculations where an Oracle performs very well. ZDNet – Oracle DB under threat? What the hell were the people thinking that granted this patent in the first place? If you have time and are interested to read up on the Oracle-Google-Android lawsuit, then check out this extensive write-up at Groklaw.com linked below. The Flower King’s mailing list was buzzing for a few days already with rumors, with guitarist, writer and producer Roine Stolt steering away from acknowledging them. 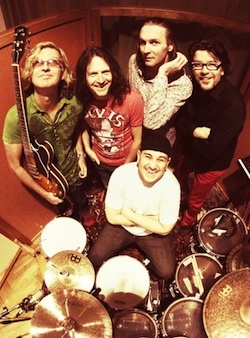 But last Friday the official news was out: The Flower Kings are reuniting in 2012 after a five year hiatus. A new album can be expected in June and a European tour will start around September. Their first re-union gig will be at the Sweden Rock Festival on June the 7th. The yet unnamed album has a 23 min epic centerpiece and the material is all classic Flowerkings style with all the dreamy melodic & cinematic elements that the bands fans has come to love over the years, but also contain some heavier psychedelic music and some darker hi energy material.